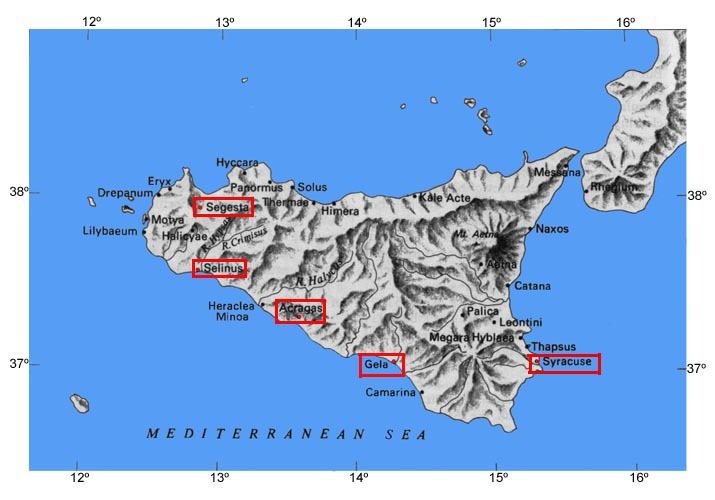 The colonization of Sicily in the 8th century BC pretty much kept the Greeks to the East and the Carthaginians to the West, but by the 7th century BC the Greeks began to expand. In 628 BC the colonists from Megara Hyblaea, about 12km north of Syracuse went West. Hoping to capitalize on trade with Carthaginians, they founded the colony of Selinus (Selinunte). They could have done a lot better on the location. The slight curve of the coast wasn’t an ideal harbor, the marshland was flat an unprotected and the land wasn’t very fertile. Mostly what grew there was wild celery (selinon), the namesake of the colony. The land further north was much better for farming but the border wars over the use of that land is what eventually killed the colony. For the most part, relations with the Carthaginians were good. Relations with the Elymian of Egesta (Segesta) in the north were not so good. The Elymian, a local tribe who traced their origins to Troy, traded peacefully with Carthage but saw the agrarian settlement of Selinus as a threat, an unwanted competitor. Things got worse when farmers of Selinus began cultivating what the Elymian considered to be Egesta land. By 580 BC, small skirmishes turned into full blown border wars that lasted over 175 years. Around 430 BC the Elymian tried to get Carthage to back them in a war against Selinus but Carthage was still sore from their defeat at the 480 Battle of Himera. Selinus was an ally of Syracuse and Carthage was not yet ready for another war. Relations between Egesta and Selinus deteriorated further and in 426 BC, the Elymian sent emissaries to Athens with a plea for military aid. They brought enough silver to pay for 60 manned ships and promised much more once Athens had defeated Selinus. Athens was intrigued. It turned out to be a very propitious timing as Athens was also planning to invade Syracuse, take its wealth and put a chokehold on the grain supply to Greece, starving Sparta into submission and winning the Peloponnesian War. The Egesta promise of wealth could possibly pay for the siege of Syracuse. And so the Athenians decided to make a trip to Egesta and check it out. By the time the Athenian emissaries arrived to Egesta, The Elymian had more than enough warning to stage one of the greatest cons of ancient times. 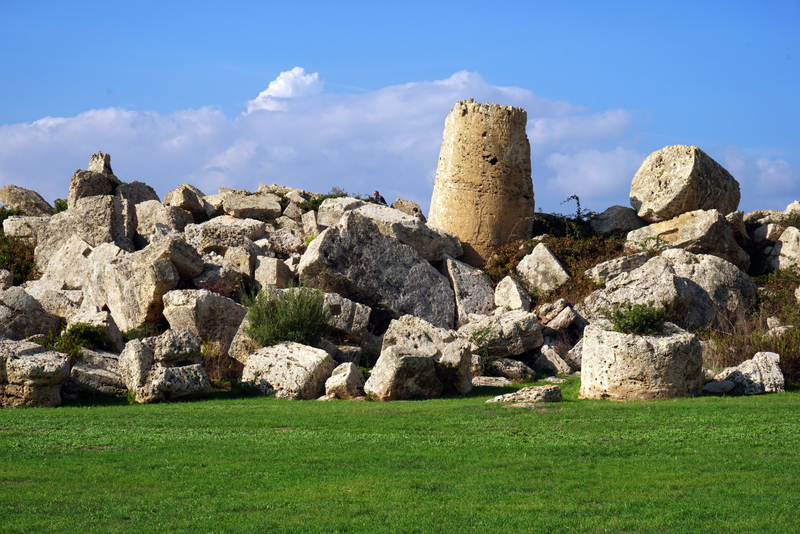 There are many stories about the events leading up to the Siege of Syracuse in 415 BC. This is my favorite. In a masterful plan to show religious alliance with Athens, the Elymian began construction of a Temple to Athena. 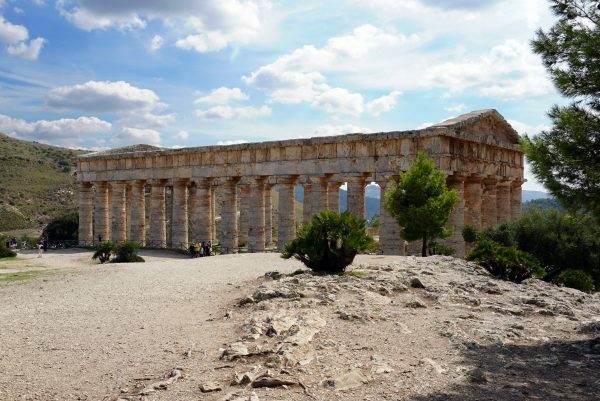 The Segesta Temple is still one of the best preserved temples in all antiquity. It was most likely designed by an Athenian architect somewhere between 426 BC and 420 BC and construction started soon after the plans were set. It’s a typical 5th century Doric Temple with 6 columns at the facades, 14 columns at the sides, triglyphs and metopes on the architrave. However, the temple was never completed. The Elymian either ran out of money or after the emissaries from Athens left Egesta, they lost interest and left it incomplete. According to my favorite version of the story, when the Athenian emissaries did arrive to Egesta they were treated to a tour worthy of a Mack Sennett comedy. 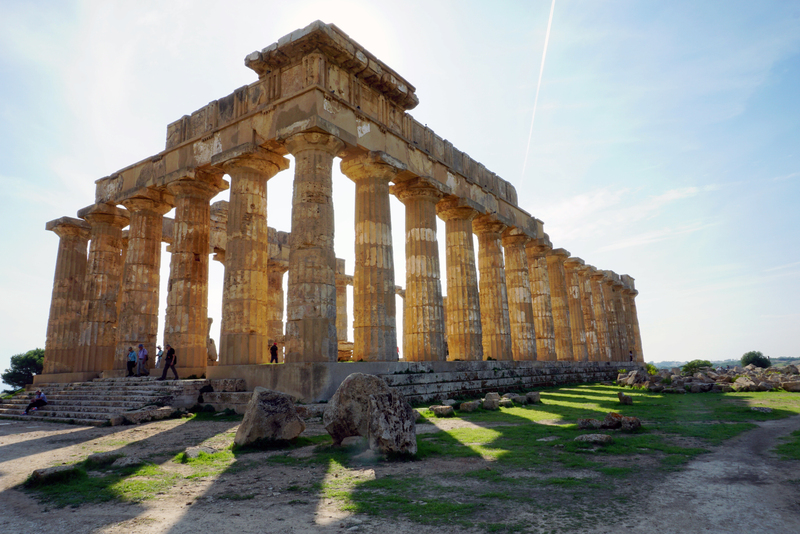 In order to set the stage, the Elymian gathered all the gold, silver and precious gems they could collect from Egesta and Eryx (Erice) and put it all into one of the houses chosen to entertain the Athenian emissaries. As the Athenians entered one house their eyes bulged the size of pie plates as the treasure was flaunted in front of them. Then, as the Athenians left the home through the front door, the Elymian removed the treasure through the back door and set it up into the next house before the Athenian emissaries would arrive. The scam went on house to house until the Athenian emissaries were convinced that Egesta had more than enough to pay for the invasion of Syracuse. By the end of the Siege of Syracuse, Athens ended up sending about 200 ships and 10,000 warriors. The Elymian never gave any more than their original deposit. In the end, in 413 BC, Athens lost the war. In 411 BC, Egesta decided to attacked Selinus without any outside alliance. They lost. Selinus, the ally of Syracuse, now felt confident to move back into the disputed northern farmland. If there were further problems with the Elymian, Selinus felt that Syracuse would come to their rescue. Just the same, they fortified the city walls. A year later, in 410, the Elymian petitioned Carthage for aid. By now Carthage had gotten stronger and feeling Syracuse was still recuperating from the war with Athens, they agreed to help. In 409 BC, over 120,000 Carthaginian troops including 4,000 cavalry invaded Selinus, breaching the fortress walls with siege towers and destroying the city. The brutal battle inside the city lasted for 9 days and nights. In the end, 16,000 (of an estimated 25,000 citizens) were killed and 6,000 were taken as prisoner. The Temples were robbed of treasures and the city buildings were razed to the ground. Eleven years later, in 398 BC, Dionysius of Syracuse took an army West to take vengeance on the Greek, Sicel, Sicani and Elymian communities that sided with Athens in the 415 BC war. Since most of these communities were Carthaginian allies, he basically declared war on Carthage. The war lasted 20 years. In 378 BC, Carthage sued for peace, but the peace didn’t last more than a year. Although Dionysius defeated Carthage, he was never able to defeat the Elymians at Egesta. After two attempts, he gave up. Egesta was well protected. In 307 BC The Tyrant Agathocles of Syracuse finally defeated Egesta just before he invaded the city of Carthage in North Africa. He lost. He fled back to Sicily, sued for peace with Carthage and died 8 years later. In 260 BC, Egesta fell to the Romans with the aid of the Elymian who were booted out of the city by Agathocles 35 years earlier. Rome felt a kinship to Troy believing its lineage went back to Aeneas, who brought the Trojan survivors very close to the birthplace of Rome. The Elymian persuaded the Romans to believe Rome and Egesta were related through their Trojan blood. As the story goes, Aegesto, the founder of Egesta, was born in Western Sicily to a Trojan mother. As an adult he traveled back to Troy and fought in the Trojan War. After the defeat of Troy, he made it back to Sicily with a group of Trojan refugees and settled the city named after him. It was a good enough story to convince the Romans to leave them be. Rome occupied Egesta and Romanized it by inserting an S in front of name. The Elymian moved back into the city as free, non paying citizens. 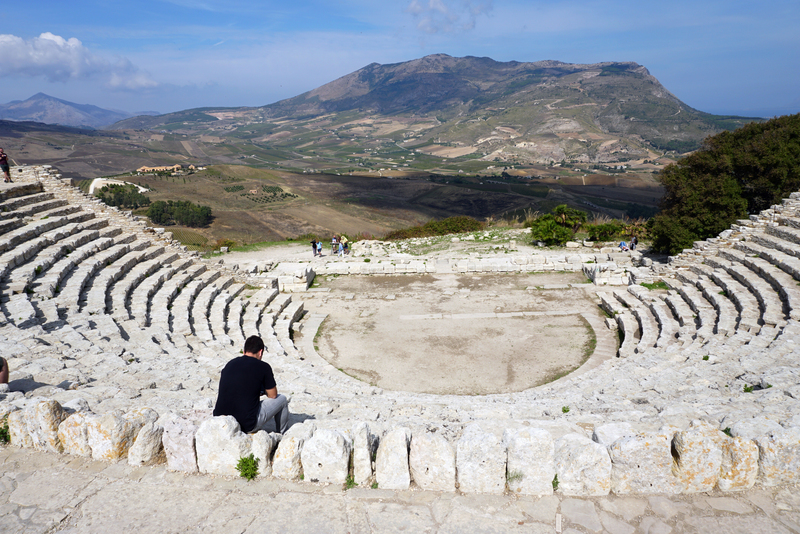 The 3rd century BC Greek Theater of Segesta is still hosts a theater season from July to September. The theater once help a capacity of around 4,000 people but now just 21 of the original 29 rows of seating remain. From its position on the slope of Mount Barbaro it commands a beautiful view all the down to the Gulf of Castellamare. The Theater was built after occupation of Agathocles, when the Elymian were killed or sold into slavery and Agathocles greekified the name of the city to Dikaiopolis (Just City). Further south, The Selinus Greeks did get their city back. They repaired the fortress walls and rebuilt some of the city but they never regained their former stature. In 250 BC, during the 1st Punic War, the Carthaginians destroyed Selinus again. This time to keep it out of Roman hands. Over the centuries the Temples collapsed from earthquakes. It’s haunting to see the round Doric segments on the ground waiting patiently to be erected once again. The site was rediscovered by a Dominican Monk in the 16th century and in the 1820s two British Archeologists, William Harris and Samuel Angel unearthed the first Temple metopes. In the 1920s the reconstruction began. It’s ongoing. The park covers 40 hectares. The temples are categorized into 4 areas and labeled with letters. There are three Temples (E, F and G) on the east hill They were constructed after 480 BC when the Greek colonies were flush with cash after the defeat of the Carthaginians at the Battle of Himera. The best preserved (or restored) Temple in the Archeological Park is Temple E, reconstructed in 1959. The metopes were removed from the site and brought to the Archeological Museum in Palermo.Most of the “very interesting” discoveries were carted off to The Regional Archeological Museum Antonio Salinas in Palermo. Consequently, the museum has one of the best collections of ancient Greek and Punic (Carthaginian) artifacts in the world. 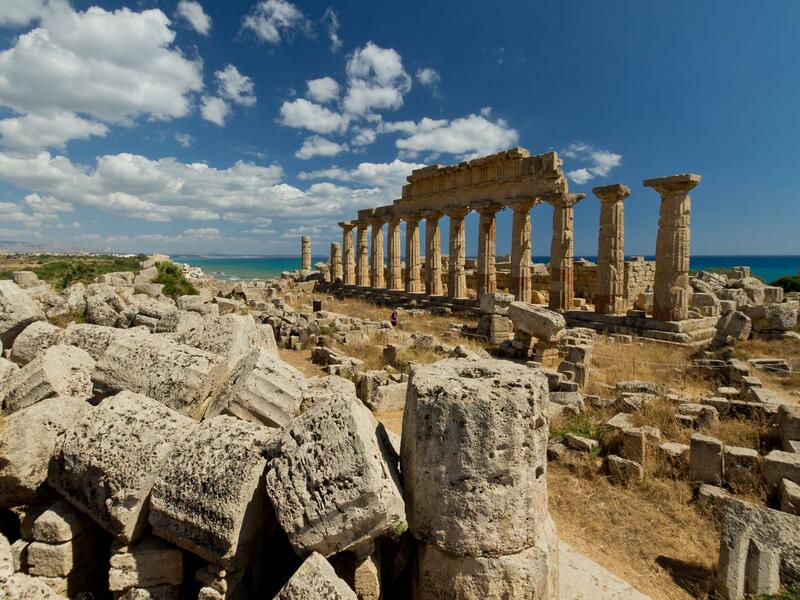 We are told the the Temple was dedicated to Hera, wife of Zeus, although some historians claim it to be Aphrodite. Ancient Archeology or History often depends on which explanation you read. Temple F dates back to the mid 6th century BC. Because of the discovery of walls built between the columns, general consensus is the Temple also served as the Treasury although no remains of treasure were found. 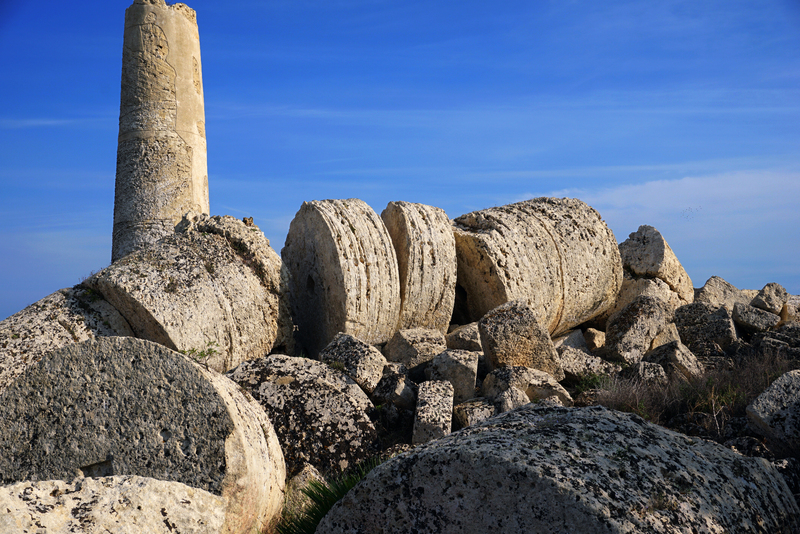 It was most likely looted during the Carthaginian Siege in 409 BC. Temple G was the largest of the group although currently it’s just a big pile of carved stones. The columns of Temple G are estimated to have once been over 53′ tall with a diameter of over 10′ wide. It was probably dedicated to Zeus or Hera. The Selinus Greeks leveled off the area between two rivers to create the Acropolis along the seafront. The reconstruction of the area began in 1927 with the Temple C, possibly dedicated to Apollo and quite possibly used an an archive. Temple C might be the oldest one in the ancient city. The last restoration was finished in 2011. 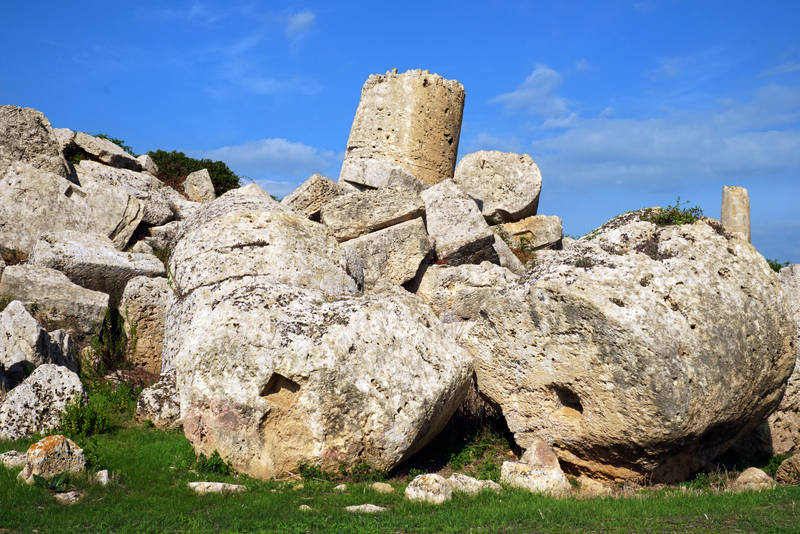 When the Temple collapsed in the 8th century it crushed part of a Byzantine village built on the hill behind it. Not much is left of Temples A and O but if you go through the portico to the area known as the pronaos, you’ll be able to find Carthaginian symbols in the mosaics. One is of the goddess Tanit, the highest female Deity as well as other symbols from the Carthaginian occupation of the city. The Manuzza Hill in the northern part of the site, the original settlement and the location of the ancient Agora (marketplace). 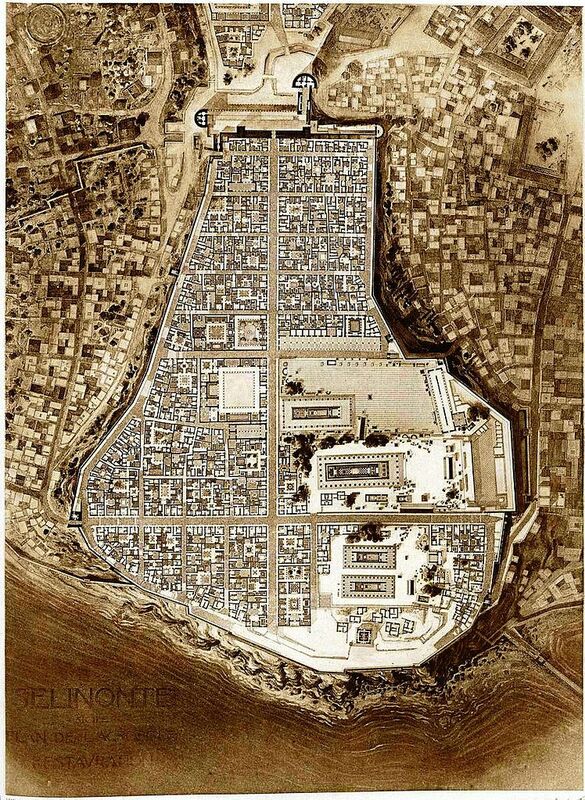 After the destruction of the city by the Carthaginians in 409 BC, this area was never rebuilt. When the Greeks came back in 408 BC they rebuilt the Acropolis and moved there. The Gaggera Hill and the Sanctuary of Demeter Malophorus, the goddess of agriculture and fertility. For the most part, the Selinunte Greeks were farmers. The raised and traded grain. Demeter was a big influence and this Sanctuary is huge. Over 12,000 offerings to the goddess were discovered in the Sanctuary. Some of them can be seen in the Archeological Museum near Temple G on the Colle Orientale. The ancient city is vast and although you’re never more than a 10-15 minute walk between the archeological zones, there are vehicles that will transport you from one area to the next. Another museum, much closer to Selinunte is the Museo Civico di Castelvetrano, about 12km north of the Selinunte Archeological Park. 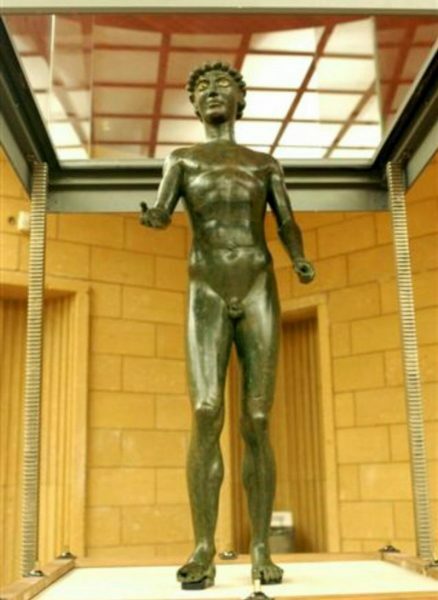 The museum is mostly a collection of coins and pottery found in Selinunte but the real prize is the Efebo of Selinunte, a 3′ tall bronze statue of Dionysius Iachos from the 5th century BC. It’s in remarkable condition. It was discovered in one of the necropolis burial sites to the north of the ancient city and brought to the Museum in 1882 and restored in 1929. The statue made the town famous. There is a story that the leaders of Castelvetrano fashioned the statue into a hat worn on special holidays. Then in 1962 it was stolen. The thieves tried to sell it on an international market but they didn’t have good contacts for illegal artifacts. In 1968, Rodolfo Siviero, an art historian specializing in the recovery of stolen art,set up a sting operation and lured the thieves to Foligno (near Perugia) with an offer to buy the Efeo. After a shootout with the police, four thieves were arrested and the statue was returned to the museum in Castelvetrano. 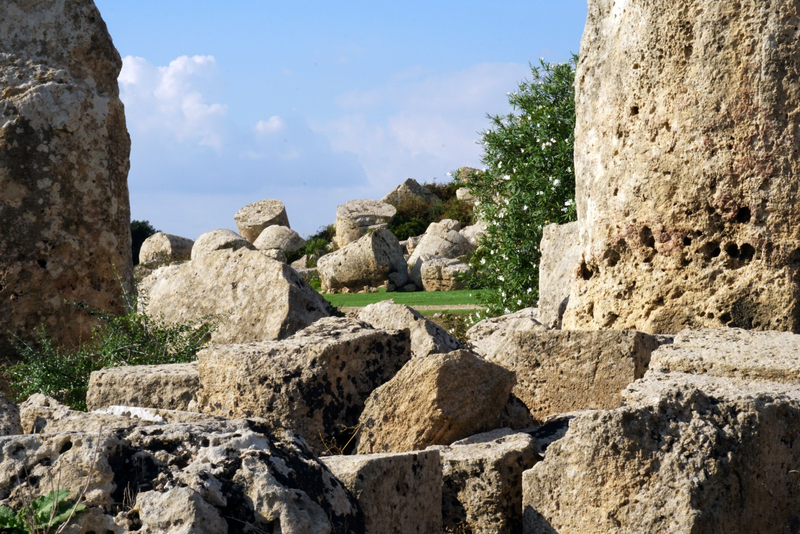 If you do have the time, the Cave di Cusa is about 15 minutes from the Selinunte Archeological Park. This is where all the Selinunte stone was mined in the 6th and 5th centuries. The rounded stones carved for temples are still waiting to be moved into place. They’ve been waiting for 2500 years, a short moment in the lifespan of a rock. CLICK HERE to find out more about Siracusa and the Greeks of Sicily.